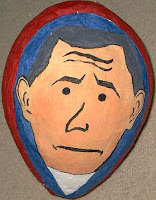 This is a George W. Bush that everyone can like. It's a hit in even the most die-hard of Democrat homes. It was my first piñata so I don't know if I did it correctly. I never had a piñata as a child, nor did I ever attend a party where there was one.